Sen.-elect Al Franken will be sworn in on Tuesday. WASHINGTON (CNN) - Senator-elect Al Franken will meet with Senate Majority Leader Harry Reid and be sworn in Tuesday, according to Reid's office. 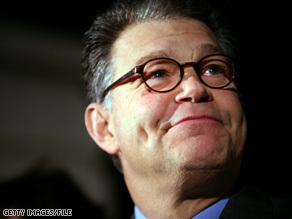 Franken has been assigned suite 320 in the Hart Senate Office Building, the same office used by former Minnesota Sen. Norm Coleman, who conceded the race earlier this week. Hey Al, I held my nose and voted for you because the other two running were the real clowns (especially Coleman). I had my doubts about you due to lack of experience and your past tendency to act like a GOPer when it came to divisiveness, but I am taking you at your word that you are humbled. I think you can be a great senator for us if you lose the attitude and reach out to those reasonable folks farther to the right on the spectrum. Here's hoping you'll make us proud! I read these liberal comments and am amazed at what patsies liberals really are. Must be psychological. cnn is right gop platform,am done watching your network .your just terrible,and millions more are doing the same, your network has turn into joe the plummer news, stupid. the bill bennett piece did it for me, ricardo sanchez, lou dobbs ,dana bash, cambell brown,john roberts,are all right wing promoters. bill bennett is a racist,thats it am done watching you on cable, but i will monitor your lies ,on the internet and still let you know my complants. you have destroyed your network yout not valid. If it is possible for the Democrats to be embarassed by a fellow Dem, this guy should do it. He makes stupid people look smart. I love how some Dems are claiming he is smart by pointing out he graduated from Harvard. Funny how these same Dems did not say Bush is smart because he graduated from Yale.